Ever since the release of the WordPress, blogging has never been the same. The versatility of the WordPress platform has made many people to choose WordPress over other blogging platforms like blogger. WordPress has been evolving constantly since the release and has now become a powerful platform to build not only blogs, but also websites for various purposes. 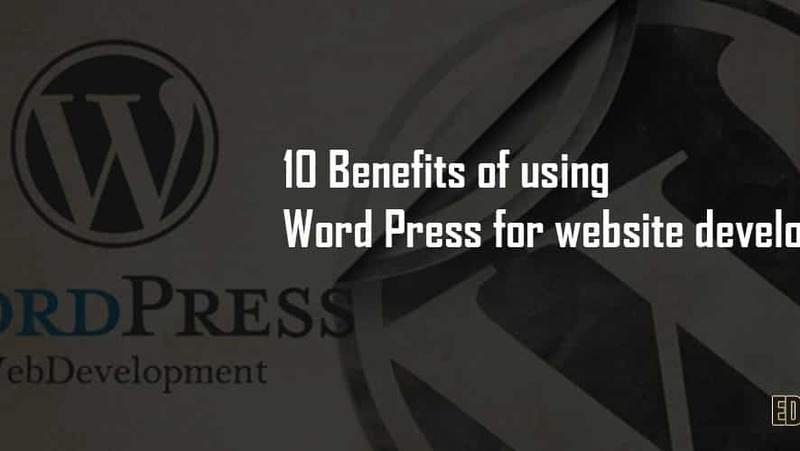 Here we list top 10 benefits of choosing WordPress for website development. Everything is made easier with the thousands of plugins that are available exclusively for the WordPress. Even the search engine optimization can be performed using some WordPress plugins. Most of the plugins are free to use. Premium plugins are also available for optimizing your website to greater extends. You must check some valuable work offering by our company. The whole layout and the graphical content and the vibrant themes are written using the CSS code. If this code can be edited, you can turn the color and theme of your website to anything you like. Unlike other website building platforms, the WordPress allows editing of the CSS code to make changes to the graphical content of the website. The very problem with the other website building platforms is that they are likely to get indexed by the search engines in a very slow manner. It is very frustrating for the developers to not see their website listed by Google or any other search engines. By using the WordPress platform, the web pages will be indexed faster. Managing a website is never an easy task. The WordPress offers different roles to manage the website such as the author, contributor, editor, and the administrator, with different privilege levels. The WordPress powered websites can be easily integrated with various social media sites like Facebook and twitter. There are lot of predefined buttons and social media plugins that can be easily inserted to the website. Building a website using the WordPress doesn’t require any skills in HTML or other codes. So WordPress is recommended for the beginners who want to set up website with less effort. All you have to do is, write or fetch the content, choose a theme and publish. WordPress support discussions and comments on the website. The comment section can be moderated and you have the power to disable comments that contain spam messages. In most of the cases, the ultimate aim of building a website is to earn money. The WordPress can be easily integrated with the Google adsense which allows you to view and manage your adsense account from the dashboard. The WordPress is available for free and we all love free stuff. So it is suitable businesses who want to take their business and marketing online. Most of the themes and the plugins are also available as free. If you have bulk content that you want to publish in, but doesn’t want to post all at once, you can schedule the content to be published if you can’t find time to publish posts every often. From these, it is obvious that there are no other close competitions to the WordPress for website development for small businesses. Don’t hesitate to choose WordPress if you are about to start a website.